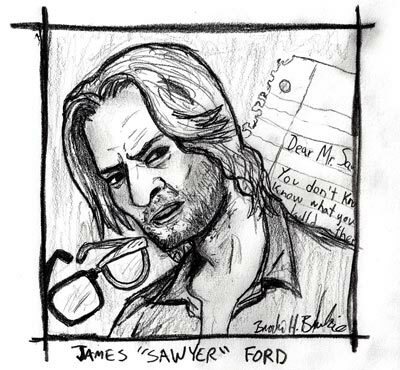 Lost portrait series #11 - James Ford aka "Sawyer" aka "La Fleur" aka "that jerk who is always snarling at people to seem like he's mean when really underneath he's a nice guy after all but then again what kind of nice guy wants everyone to think he's a jerk? Sounds kind of actually jerky to me." 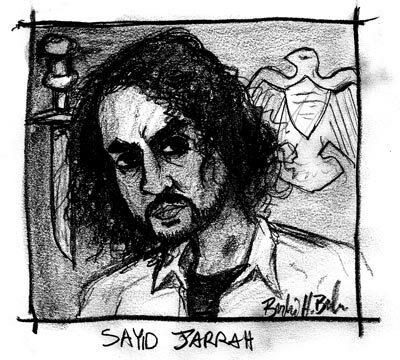 Lost portrait series #12 - Sayid Jarrah. The man who totally hates torturing people but, gosh darn it, just keeps winding up in these situations! What's a fella to do? Fish gotta swim, birds gotta fly, Sayid's got to torture. Or kill. It's what he's good at. Also: yearning.